Director – Tim Story, Screenplay – Mark Frost & Don Payne, Story – Mark Frost & Jack Turman, Based on Characters Created by Jack Kirby & Stan Lee, Producers – Avi Arad, Bernd Eichinger & Ralph Winter, Photography – Larry Blanford, Music – John Ottman, Visual Effects Supervisor – Scott Squires, Visual Effects – Giant Killer Robots, Hammerhead Productions, Hy*drau*lx (Supervisor – Jake Morrison), The Orphanage Inc (Supervisor – Stu Marschwitz) & Weta Digital (Supervisor – Eric Saindon), Special Effects Supervisor – Mike Vezina, Creature/Makeup Effects – Spectral Motion Inc (Supervisor – Mike Elizalde), Production Design – Kirk M. Petruccelli. Production Company – 20th Century Fox/Marvel Enterprises/1492 Pictures/Bernd Eichinger/Constantin Film/Ingenious Film Partners/Dune Entertainment LLC. As Reed Richards and Susan Storm prepare to marry in a wedding that is followed by the media, the Earth experiences various bizarre weather anomalies. The military ask Reed’s help in building a sensor to track the high-levels of cosmic radiation that surround each of these events. Reed declines because of the wedding but then builds the sensor in secret, hiding it from Susan who expects him to concentrate on their pending nuptials. As the wedding ceremony begins, a shimmering silver humanoid figure riding aboard a silver surfboard appears over New York and destroys the sensor. Johnny pursues the figure but is dragged into the upper atmosphere and then dropped from orbit. He survives but is left with the ability to swap superpowers whenever he touches any of the rest of the Fantastic Four. Disappointed with Reed’s inability to stop the alien surfer, the military bring in a revived Victor Von Doom to assist. They discover that the Silver Surfer, as Reed nicknames it, is a herald that serves an entity known as Galactus that devours entire worlds and that the Surfer has come to prepare the way for the Earth’s destruction. As Reed devises a means to separate the Surfer from his surfboard, they must deal with the treacherous Von Doom who is planning the steal the surfboard for himself. Fantastic Four (2005) was a reasonable success among the 00s bunch of Marvel Comics adapted films – Blade (1998), X-Men (2000), Spider-Man (2002), Daredevil (2003), Hulk (2003), The Punisher (2004), Elektra (2005), Ghost Rider (2007), Iron Man (2008), Captain America: The First Avenger (2011), Thor (2011), The Avengers (2012), Guardians of the Galaxy (2014), Ant-Man (2015), Doctor Strange (2016), as well as the tv series’ Agents of S.H.I.E.L.D. (2013– ), Daredevil (2015-8), Agent Carter (2015-6), Jessica Jones (2015– ), Luke Cage (2016-8), The Defenders (2017), Inhumans (2017), Iron Fist (2017-8), The Punisher (2017– ) and Runaways (2017– ). Director Tim Story, co-writer Mark Frost and all of the principal cast of Fantastic Four returned for this sequel. Fantastic Four: Rise of the Silver Surfer turns to one of the most fascinating superheroes in the Marvel canon – The Silver Surfer. The Silver Surfer was a co-creation of Marvel godfather Stan Lee and cult comic-book artist/writer Jack Kirby. The Silver Surfer first appeared in Fantastic Four #48 (1966), before gaining his own title The Silver Surfer (1968-70) and going onto become a major character in the Marvel universe. (The idea of the Silver Surfer and his surfboard apparently came about because Jack Kirby was sick of drawing spaceships). According to Marvel canon, The Silver Surfer is Norrin Radd, an astronomer from the planet Zenn-La, who makes a deal with the intergalactic world destroyer Galactus to save his own world by acting as a and scouting out the habitable planets that Galactus needs to devour as food. After his encounter with the Fantastic Four and in particular Ben Grimm’s girlfriend Alicia Masters, The Silver Surfer was moved to stand up against Galactus and prevent the Earth’s destruction. For doing so, Galactus exiled The Surfer, imprisoning him inside a barrier that prevented him from travelling beyond The Earth. 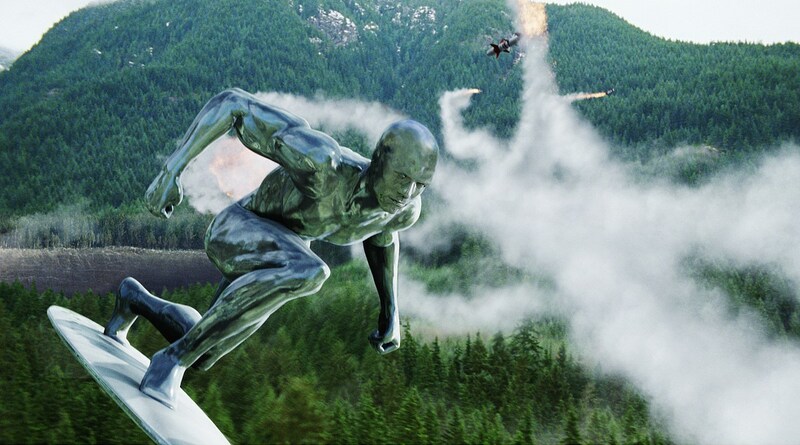 The Silver Surfer has appeared on screen a number of times. He turned up in episodes of both of the Fantastic Four animated tv series The Fantastic Four (1967) and The Fantastic Four (1994). There was then an original animated tv series spun off from the latter show with The Silver Surfer (1998) where the Surfer was voiced by Paul Essiembre, although this only lasted for 13 episodes. In 1980, there was the announcement of a live-action Silver Surfer film, which was reportedly to star Olivia Newton-John, although this never emerged. While Fantastic Four was undemandingly likeable, Fantastic Four: Rise of the Silver Surfer ends up in being a considerable disappointment. One had a sinking feeling about Fantastic Four: Rise of the Silver Surfer when the script was announced as from former The Simpsons (1989– ) writer Don Payne whose previous venture into superheroics was the ultra-lame My Super Ex-Girlfriend (2006) and who would go onto co-write Thor. In the first film, Tim Story, the writers and the cast did a worthwhile job in crafting the characters of the Fantastic Four and their various tensions. Most of that feels like it is delivered on autopilot by the time of Rise of the Silver Surfer. Most notable is Michael Chiklis’s performance as Ben Grimm, which was one of the high points of the first film. Here Ben lacks the pathos Michael Chiklis brought first time around and looks no more than a big lugubrious, gruff-voiced truck driver with a soft heart whose only purpose in the film is as a lunkheaded comic prop. Jessica Alba is again badly miscast in the role of Susan Storm and does little to animate the part. Julian McMahon returns as Victor Von Doom and in the few scenes when he appears, particularly one where Jessica Alba confronts him, manages to look calculatingly evil but is relegated to little more than a supporting character this time around. The only character who presents any life is Chris Evans who again plays Johnny Storm’s cocksure self-certainty with an appealing swagger. (Stan Lee also makes an amusing cameo as himself, being turned away from trying to gatecrash the wedding ceremony). Particularly irritating this time around is Tim Story’s substitution of awkward lowbrow comedy in lieu of anything that approaches character development – Reed Richards is dragged off on a bachelor party and we see him twisting his limbs on the dancefloor; there is a good deal of not particularly funny humour centred around a plot device that requires the various principals to swap superpowers and with Ben constantly trying to hug a scared Johnny. (Usually when a science-fiction tv series has an episode with the continuing characters swapping bodies/powers or encountering evil or alternate world versions of themselves, it is the sign that it has run out of creative energy). Probably the most disappointing aspect of the film is its handling of such a wonderfully original character as The Silver Surfer. Although we get mention of Norinn Radd, his deal with Galactus and the unnamed girlfriend and homeworld that he tries to protect, The Silver Surfer here is lacking in any of the cosmic grandeur he had in the comic-books. The comic-book Surfer stood outside humanity and above notions like good and evil but also felt compassion and acted according to a nobility – the comic-books were frequently memorable for their haunting soliloquies and observations on the human condition. More disappointing on a physical level, The Silver Surfer here looks like no more than a primitive CGI effect circa 1989-91, not 2007 and the era of a digitally created Gollum and motion capture animation. Even more disappointing is the depiction of Galactus who comes bereft of any but the most minimal explanation as to what it is. Tim Story made the deliberate (and probably correct) decision not to show Galactus as the giant galactic robot he was in the comic-books. All that we get instead is a big sinister cloud heading towards Earth – for all the world just like V’Ger from Star Trek – The Motion Picture (1979). The biggest disappointment is how Galactus’s threatening of The Earth and the Silver Surfer’s mutiny and climactic saving of The Earth are sketched in the most routine and minimalist terms. If only Tim Story and Don Payne could have imbued these scenes with something of the poetry of a Jack Kirby comic-strip, we could have had a classic. (Still there is some hope in that within a matter of days of Fantastic Four: Rise of the Silver Surfer‘s release, Marvel Entertainment announced a stand-alone Silver Surfer film, purportedly with Alex Proyas directing, although this was subsequently been dropped). 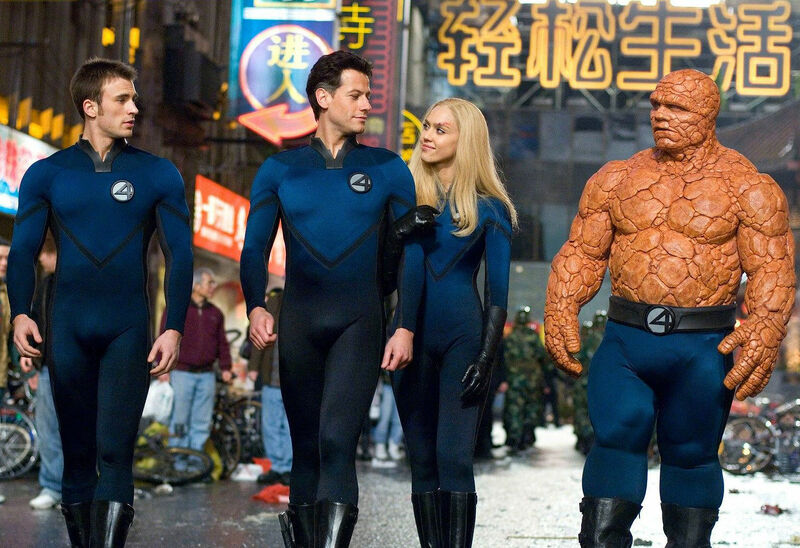 The Fantastic Four were cinematically rebooted with Fantastic Four (2015).